- The unit uses high volume air flow and moderate heat for drying to ensure the gentle drying of fabrics. - The WrinkleBlock tumbling feature reduces the amount of wrinkles in the load by tumbling the load for one hour in order to reduce ironing time. - Use the low heat option for specific kinds of fabric such as wool and delicates. - Dry lighter loads in reduced drying time with the Touch Up cycle. - The 3.9 cubic ft. drum makes this unit a handy dryer for small homes. - Adjust the drying temperature with the adjustable temperature option, which lets you determine the level of heat. Use little to moderate heat for delicate fabric types. - Check status indicators in the LED screen, which is easy to read. 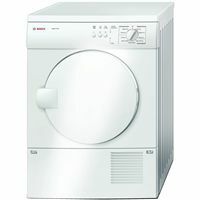 - The stylish white finish gives the unit an elegant look. - Automatic moisture sensors tells you how much moisture is in the load before the machine sets the appropriate drying time or adjusts the duration of the drying cycle accordingly. - The timed dry feature allows you to set the duration of the drying cycle yourself. - The control buttons allow for one-touch operation. - The stackable design allows users to stack the dryer on top of the washer to save on space. - The lint filter indicator tells you when the lint filter needs to be cleaned to avoid clogging the filter and having accumulated lint flow back to the drum where it can be sucked up by the exhaust system. One of the main advantages of this dryer is the quiet operation at least until before the cycle ends, when some units have been observed to emit chugging sounds. Another advantage is the stackable design that allows users to save up on laundry room space. The dryer is powerful enough to handle the task and comes with all the necessary features for efficient drying. It is compact and very easy to use. Missing features like the Delay Start, interior light, and some controls are the reasons why this machine gets lower ratings compared to other dryers in the same price range. The galvalume tub material is a step down from stainless steel and tends to wear down more quickly. Snags are not uncommon after several months of using this dryer. Other missing features include the Air Fluff/ No Heat feature, jeans cycle, and active wear cycle . The machine also lacks the audible signal, which tells you that the cycle is done.